Stomach cancer. Barium meal X-ray of the abdomen of a patient with stomach cancer. The barium (the bright areas) has highlighted the cancer (bright white area at centre and upper left). The barium is also in parts of the intestines (across bottom). A cancer of the stomach is usually a glandular cancer of its inner lining. At an advanced stage, the chances of recovery are poor. Treatment involves surgery to remove cancerous areas, and also radiotherapy and chemotherapy. 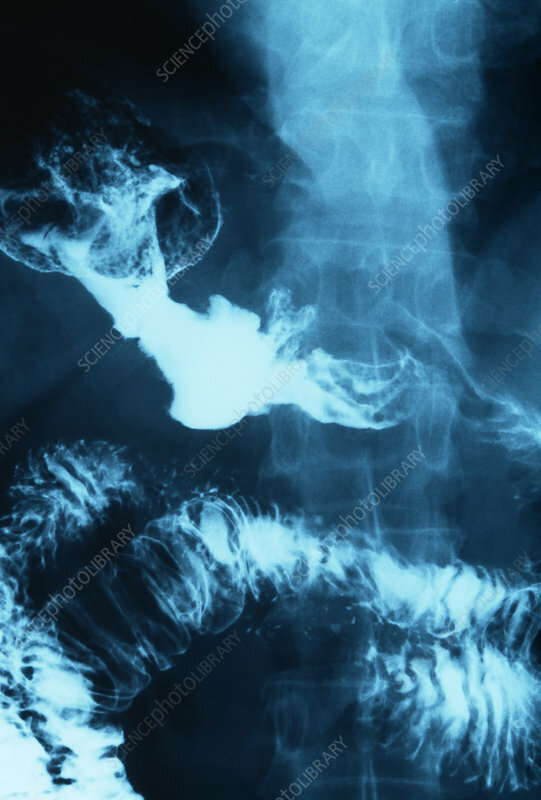 Barium, opaque to X-rays, is taken as a meal when imaging the stomach and the upper intestines. The spine runs down right.